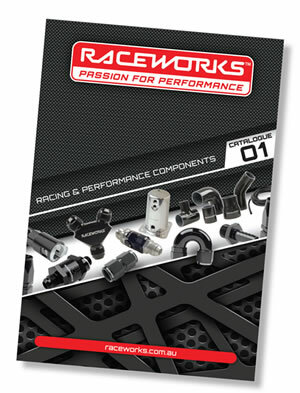 Raceworks has released a new Racing and Performance catalogue, featuring an exciting collection of new products. The catalogue is available in full colour, including high resolution images and detailed technical data, to easily identify the high performance component you need. New product lines introduced include “100 Series Cutter Style” fittings, with matching hose available in traditional silver stainless, and black nylon for a more conservative look. Raceworks’ high quality silicone hose range has expanded to include 23° and 67° elbows, and is now complemented with a range of full-stainless T-Bolt hose clamps. Another exciting aspect of the catalogue is the inclusion of Raceworks High Performance Ignition Leads, which are designed and manufactured in the USA. The range has been specifically developed to meet the most demanding requirements of modern performance engines, delivering unmatched durability, spark delivery, and temperature flexibility. Raceworks’ new catalogue features many other exciting high performance air, fuel and fluid management components. All Raceworks products come with a 2 year warranty, and are manufactured from high quality materials to maintain the highest component standards. Raceworks components are available through a network of specialised resellers and leading automotive retail groups who share a passion for performance. Visit www.raceworks.com.au to locate your nearest stockist.